The last few weeks, months, really, have been very hectic for me. I’ve had a lot on my plate and my mind. Just to name a few things, we had the stress and anxiety of our daughter’s wedding, I got sick, pneumonia, just before the “big event”, and announcing my call to preach, among other things, all added, shall I say, a little extra to my acid reflux. Over the past few weeks I had been putting so much thought and time into other things I let “my” time with God kind of slide onto the back burner. This week He gently reminded me of this. And I’m so thankful He did! Sometimes we can get so busy with “stuff”, even good thing like praying for others and trying to be a help to someone, that we neglect our own spiritual health. The Lord showed me that I had allowed this to happen and that I was suffering for it. While we always want to be a help, to edify when we can and to intercede for others, we have to remember that we need our time every day in our prayer closet just for ourselves. As Pastor Danny said, nothing can take the place of the fellowship we have one-on-one with our Lord. And it is imperative that we not neglect that daily time. I’m certain I see the tunnel now. And I know there is a light at its end. I woke today feeling like you feel after you’ve had the flu: worn out. It is actually a good feeling though. So far, today has been free of body aches, headaches and no fever symptoms either. It will be tomorrow morning, to make sure I’m 24+ hours fever-free, before I know I’m actually over it. I am forgoing any couch syrup or other cold meds so I can get an accurate feel for well-or-not. That was the doctor’s instruction. God willing, I’ll actually be able to leave the house some tomorrow! And if I’m well I’ll not have to ‘beg out’ on my Sunday School obligation this week, like I had to for last night’s service. The first day the boy had driven 37 nails into the fence. 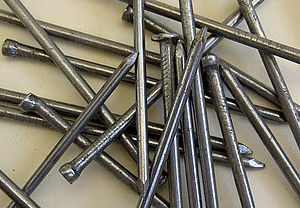 Over the next few weeks, as he learned to control his anger, the number of nails hammered daily gradually dwindled down. He discovered it was easier to hold his temper than to drive those nails into the fence. Finally the day came when the boy didn’t lose his temper at all. He told his father about it and the father suggested that the boy now pull out one nail for each day that he was able to hold his temper. The father took his son by the hand and led him to the fence. He said, ‘You have done well, my son, but look at the holes in the fence. The fence will never be the same. When you say things in anger, they leave a scar just like this one. You can put a knife in a man and draw it out. But It won’t matter how many times you say I’m sorry, the wound will still be there. Joh 15:14-16 Ye are my friends, if ye do whatsoever I command you. (15) Henceforth I call you not servants; for the servant knoweth not what his lord doeth: but I have called you friends; for all things that I have heard of my Father I have made known unto you. (16) Ye have not chosen me, but I have chosen you, and ordained you, that ye should go and bring forth fruit, and that your fruit should remain: that whatsoever ye shall ask of the Father in my name, he may give it you. The point I guess I’m trying to make is this: Though you might have read something many times, I’ve read this a dozen times in the last month probably, you never know when the Holy Spirit will open your heart and mind to something new. So listen up as you read and study, He might have something new for you at any time, any study session. Today I awoke, just like everyday, to my usual morning routine. I’ll not bore you with the details of it though. It is another ordinary day. But is it really? I woke up today. I was able to go about doing the things I normally do. I got to enjoy the sounds and sights and smells of God’s wonderful creation from my deck as I do most mornings. I was able to pray and read the Bible a little while. And I am able to write this blog post. All of these things are pretty unextraordinary, or are they? I am able to do each thing because God, in His mercy, love and generosities, saw fit to allow me to do them. Each day, each action, everything we do are gifts from the Almighty Himself. How often do we take the time to consider that? Probably not often enough.